MRE started by running slot racing tracks at exhibitions and corporate events, notably at Olympia and Silverstone. We started taking cars and accessories for sale to these events, and this grew into swapmeets and other shows. 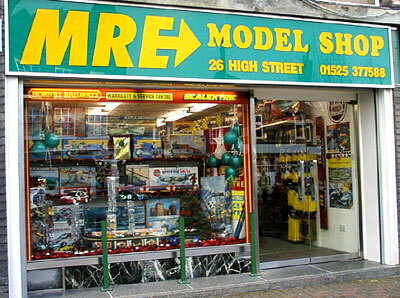 With so much stock, the first MRE Model Shop opened in 1999, and the range soon increased to include model railways, radio control cars, plastic kits, and diecast models. Within 3 years we had to move to a new shop with a High Street location and more than three times as much space ! With model railways now forming such a large part of MRE, we became a Hornby Collector Centre and a Dapol Gold Stockist. 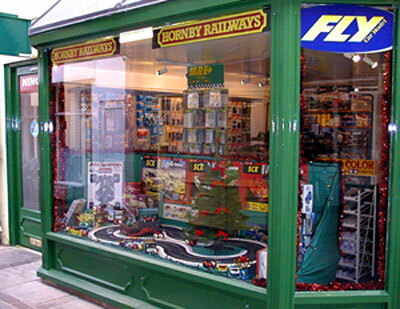 With the increased popularity of N Gauge and new ranges such as Hornby Skaledale we soon found that shop space was filled up, and we had to limit our stocks of Radio Control and Diecast to cope with increasing customers for slot racing and railways. As technology increased, so did MRE and we launched our new e-commerce website in 2005 with a bigger product range and all the latest technology. With the expert capabilities of our web team at Virtual Relations we have one of the fastest and most comprehensive websites, catering for club members discounts, overseas customers, VAT and shipping, and of course our regular news items. Our unique arrangement with some major clubs and manufacturers means that members can buy much cheaper online at MRE. With online traffic increasing over 1000% in the last couple of years, many homes and customers can use broadband for shopping online while at home or work. MRE have again moved with the times, closing the shops and moving into our new warehouse premises to cater for this new lifestyle. You can visit us and buy, or you can order online. Best prices at MRE ? MRE has lots of stock to buy. You can also make advance orders for new items by reserving them, and pay less by becoming a regular customer ! Our discount system means that the more you spend the less you will pay for your orders.